Today I decided to create a free theme for WordPress based on my current blog theme. The design and customized CSS is all mine but the theme coding is from the Cutline theme by Chris Pearson. The Cutline theme is my favorite WordPress theme to customize since I’ve been using it for so long and know the code inside and out. For this design, I’ve added a few customizations: a favicon, drop cap styling, and a wrapper for a more organic “outside of the box” header design. The Crows theme is FREE. 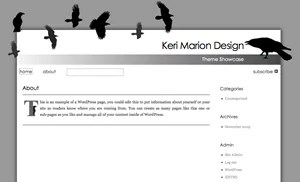 Visit Keri Marion Design to preview the theme or download for your WordPress blog. If you decide to use the theme, feel free to comment on this post or drop me a line with your blog url. To use the drop cap styling, start your post in HTML view in the post editor. Before the first letter of the first sentence add (without the outside quotes) “<span class=”cap”>” and immediately after that first letter add (without quotes) “</span>”. It should look like the letter “T” in the first paragraph of this post. I included a favicon with this theme. To use it you will need to copy the file “favicon.ico” from the images folder and paste it into your root directory then upload it. Yeah, I think my comments on here a messed up from a plugin. Constantly trying out new stuff here. Well done man! Your theme struck me when I first came, but I didn’t realize you made it. That adds a whole new sense of legitimacy to your blog. Although your comments seem a little off.